The Histree Trail project finished in 2009, so some of this information is out of date now. But lots of it is not! The project was first created and hosted by the Isle of Wight Council's Countryside Section. The Isle of Wight Histree Trail Project ran from 2006-2009. The project was dedicated to finding and recording the Island’s special trees, collecting local stories and researching local heritage. A series of trails were created to guide walkers around groups of trees in publicly accessible places. Explore the wonderful snaking boughs of the Dragon Tree, cascading canopy of the Umbrella Tree; venerable Bound Oaks, gnarled old Yews and even a tree with a mysterious tree with a ghostly past. The trails range in length and difficulty from shorter town trails taking in street and park trees, circular rural routes through ancient woodland to the more challenging cross-Island trail. Nest boxes were constructed by local young people to help waymark the feature trees on each trail assisting with identification. Many of these have now gone, but some remain, along with the circular waymarks which can still be seen in some locations. There are eight Histree Trails across the Island. 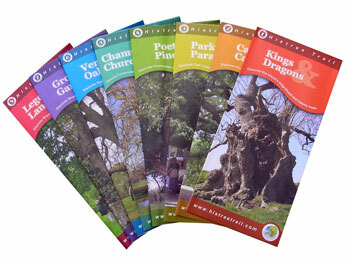 Each trail is accompanied by a leaflet which takes you on a tour of the finest trees. The project is now over but you can download online versions of the the Histree Trails leaflets here. Note that these trails are no longer accurate, and several of the trees in them are now lost to old age or inaccessible. The Histree Trail Project was initially a two year project launched in November 2006 with support of a £47,000 Heritage Lottery Fund grant. Because of the success of the project it was extended by a further six months until March 2009. The first 18 months of the project were dedicated to finding and recording the Island's special trees, collecting local stories and researching local heritage. The next stage was to put all the information together and design the series of trails which were dictated by the location of groups of trees in publicly accessible places. The involvement of the community was fundamental to the project. Almost 100 volunteers contributed to the Histree Trail Project, some of whom were dedicated, long-term volunteers, regularly attending site visits with the project officer and assisting with tree surveying. During the project, over 200 trees were recorded with at least 50 having some kind of heritage linked to them whether they were planted by somebody famous, mark an ancient boundary, have a special name or are just plain magnificent! The project was supported and funded by the Heritage Lottery Fund and hosted by the Isle of Wight Council. The council no longer supports the project and is not involved in managing it. The trails information and files are now held by Pinkeye Graphics Ltd. We hope to one day revise and republish them. If you're interested in updating one or more of the trails, and maybe reprinting them, we'd love to hear from you!